The Question of Genre: What is Crime Fiction? Trending: Why is Golden Age Fiction fashionable again? Murder Least Foul: Teapots and Crafts Shops and Cats. Oh My! 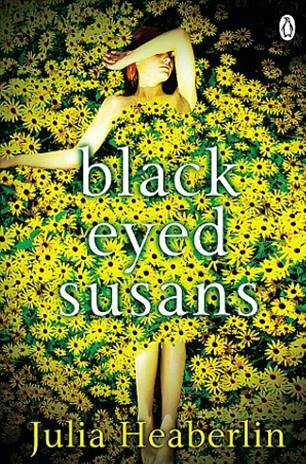 One of the darkest gothic thrillers of recent memory is the remarkable Black Eyed Susans by journalist Julia Heaberlin from the Michael Joseph imprint at Penguin Random House. With film rights sold, huge critical acclaim including being longlisted for the 2016 CWA Ian Fleming Steel Dagger Award; Shots Magazine’s Assistant Editor Ali Karim was delighted to meet up with the author at Theakstons Crime-Writing Festival in Harrogate, and discuss this phenomenal crime mystery novel. Joining us was Kiwi Crime’s Craig Sisterson, who had been equally startled at this very dark and thought provoking thriller, and interviewed Julia here in one his renowned 9mm Interviews. 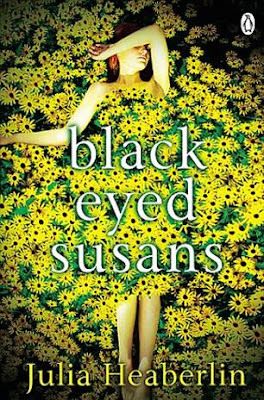 Seventeen-year-old Tessa, dubbed a "Black-Eyed Susan" by the media, became famous for being the only victim to survive the vicious attack of a serial killer. Her testimony helped put a dangerous criminal behind bars - or so she thought. Now, decades later, the case has been reopened and the Black-Eyed Susans planted outside Tessa's bedroom window seem to be a message from a killer who should be safely in prison. Tessa agrees to help with the investigation, but she is haunted by fragmented memories of the night she was attacked and terrified for her own teenage daughter's safety. Can she unlock the truth about the killer before it's too late? Julia Heaberlin is an award-winning journalist who, before launching her career as an author, worked at several national newspapers. She has edited numerous real-life thriller stories, including a series on the perplexing and tragic murders of girls buried in the Mexican desert and another on domestic violence. She lives with her husband and son in Texas. I had to ask Julia about the significance of the title, as well as the powerful cover imagery. Julia indicated that the novel came to her as an image, a woman lying on a bed of the eponymous American wild-flower, though she indicated that it was her British Publishers [Penguin Random House] that came up with the stunning cover design first, and one that was adopted for American Release at Random House US, as well as many other territories. Self-depreciating and very modest, she lays down huge thanks to those who helped her in her research, especially the forensic background; though the image of the Flower, the Black Eyed Susans is the image that haunted her, and was pivotal in the evolution of the story. Though it would be a visit to the outside of a Texan Penitentiary where Death Row prisoners are housed that would lead to her narrative taking shape, which she details in this essay for our readers. As part of her research for Black-Eyed Susans, Julia Heaberlin stood outside the Death House in Texas during an execution. Here, she relates her experience. Everything quivers. The trees, the grass, the birds. The ribs in my chest, the balls of my feet. The air, brittle with chill and death even before the thundering noise began. I feel like I am about to explode from the inside out. When people ask me what it is like to stand outside the Texas death chamber while a prisoner is being executed, this is what I remember first. The man executed that particular night was Edgar Tamayo, a Mexican national who shot a Houston cop three times in the back of the head. The terrible sound was the revving of motorcycles from the nearly two dozen retired police officers parked as close to Edgar Tamayo as they could get. They demanded that he hear the guttural protest of their motors through the walls as the needle was going in. Kill him, roared the motorcycles. Kill him. And make no mistake, Edgar Tamayo, his family, and the witnesses he chose, could hear. It is easy to stand only yards away from the tiny, nondescript room in Huntsville, Texas, that is the busiest execution factory in the United States. Since 1982, my state has killed more than 525 prisoners. The death chamber is housed on the corner of “The Walls,” a historic, friendly looking prison with a green area and a clock tower. In Texas, executions have been performed by rope, poison and electricity for almost 200 years. The Walls unit sits in the middle of town a few blocks off the quaint square. There is a barbecue grill on the front porch of the white frame house next door, and an old neighborhood stretches out beyond it. Within sight of the walls, while men die, people are munching on pie and chicken fried steak at the best restaurant in town. They don’t mean anything by it; it’s a matter of routine. Back when the electric chair was used, the lights of the whole town used to shiver when the executioner flipped the switch. If the town folks who live here don’t work for the prison system—seven sprawling units in all— their parents probably did or their grandparents. Sometimes, I take my mind back to the night of Edgar Tamayo’s death. Survey the scene. On that night, and most execution nights, the screaming politicians and social media fanatics are far from the town of about 40,000 in the piney woods of East Texas. The crowd I’m with is small, mostly Hispanic. Two beautiful Mexican TV reporters are brilliant stars in the dark, illuminated by camera lights, one in a brand-new purple tie, another in bright red lipstick. Mexico, despite its ongoing battle with corruption and brutal cartels, is anti-death penalty. The government is vigorously protesting the execution of one of its own on our soil. A group of mourners kneel by Edgar’s picture and sing, their mouths opening and closing like birds. Gloria, who runs a straggly group of regular, vocal protesters, chants through her bullhorn that an innocent man is about to die even though he is not innocent at all. Some of them hold signs that declare Rick Perry a serial killer (279 people were executed during his time as governor). Another group of five men and women, all white, all older, weigh down a street corner. Most of them make the drive from Houston to as many executions as they can. They come not to yell but to be present for the family of the executed. On the coldest nights, the most stalwart, a criminal justice professor in Huntsville, stands by the Stop sign alone with his battery-operated Christmas candle until the family of the executed walks out the door. He is tired and cynical and understandably does not want to talk much. He has been talking to tourists like me forever. Ice starts to fall. I re-examine why I am here and why I have not been here before. I am writing a novel, a story meant to entertain. I showed up out of convenience, curiosity and a desire to be authentic in my book. I had casually Googled the Texas execution schedule two months before: Should I pick the woman who helped a group torture and murder a mentally ill man for his life insurance? The man who ate the doughnuts and breakfast tacos that he ordered after beating the delivery woman with a baseball bat? A boyfriend who repeatedly stabbed and killed the married woman he was sleeping with and her daughter and three-year-old grandson? A guy who kidnapped a young Houston couple, raped the woman and then killed them both? In the end, I picked Edgar, and so we were united. The day of his death fit into my schedule. I asked a friend to come with me. We chattered and ate sour gummies and red licorice on the three-hour ride from Dallas to East Texas. We booked at a lovely bed and breakfast only a few blocks from the Death House. I am horrified as I write that last paragraph. I was raised by a woman who gave spiders a free ride out of the kitchen on a newspaper. There was no death penalty in our house. I was a sensitive kid who didn’t believe my God would send anyone to hell. I couldn’t stomach violent movies, much less the barbaric concept of it being legal to kill someone. As I grew older, I was further shaped by intellectual reasoning—that the death penalty is part of a racist and unfair system. I protested by voting for candidates who believed as I did. Then came Edgar Tamayo. The roar of motorcycles. The victim, Guy Gaddis, a 24-year-old police officer, two-and-a-half years on the job. He left an expectant wife behind. When I arrived back home, the experience began to shape my story, my characters, in ways I didn’t plan. I poured out a chapter I feared my editor would cut entirely. She never touched a word. The lawyer, so important to this part of the story, sprang to life. Tessa, my heroine, would not cooperate. She was conflicted about the death penalty no matter how much I tried to convince her otherwise. How can you know how I feel, she asked me, if you’ve never experienced something this terrible? If evil hasn’t ripped out a staggering piece of who you are? Don’t preach, she told me. Let me be who I am. 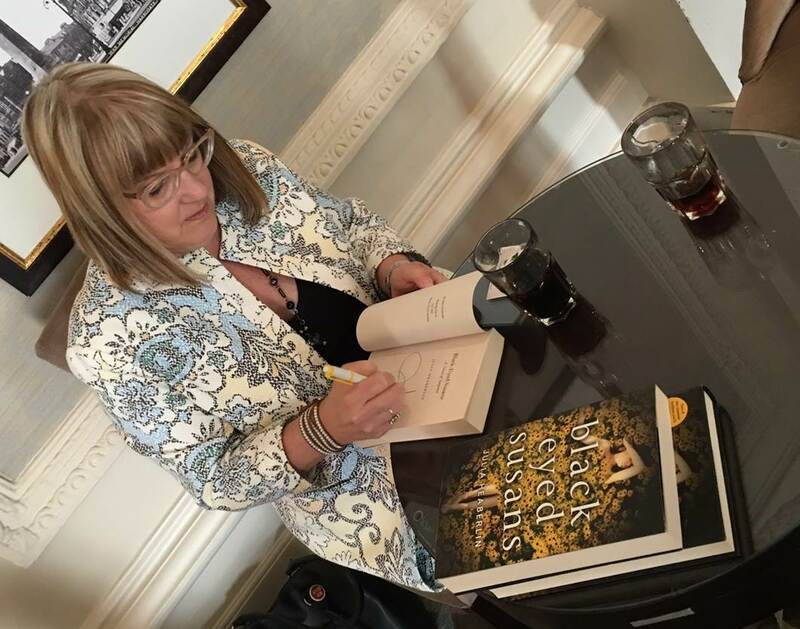 Shots Ezine wish to thank Gaby Young [of Penguin Random House] and Ann Chadwick [of Cause UK / Harrogate International Festivals] for arranging and facilitating the meeting with Julia Heaberlin at the 2016 Theakstons Crime-Writing Festival in Harrogate, England. This year the Australian Crimewriters Association will honour Carmel Shute with a Lifetime Achievement Award. As a founder and national co-convener of Sisters in Crime Australia, Carmel has spent 25 years supporting and nurturing Australian women crime writers. A FADING All Black, a teen runaway, a cop in witness protection, and a robotic private eye are among the memorable characters at the heart of novels named today as finalists for the 2016 Ngaio Marsh Awards. An extended judging process has led to two very strong shortlists, says Sisterson. This year, not only will the Ngaio Marsh Award for Best Crime Novel, established in 2010, be presented at the Great New Zealand Crime Debate at WORD Christchurch Writers & Readers Festival on 27 August, but also a new Best First Novel prize for debuts. • AMERICAN BLOOD by Ben Sanders (Allen & Unwin). • TWISTER by Jane Woodham (Makaro Press). 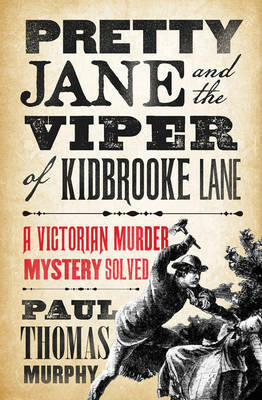 Pretty Jane and the Viper of Kidbroke Lane is by Paul Thomas Murphy. In April 1871, a constable walking a beat near Greenwich found a girl dying in the mud - her face cruelly slashed and her brains protruding from her skull. The girl was Maria Jane Clouson, a maid for the respectable Pook family, and who was pregnant at the time of her death. When the blood-spattered clothes of the 20-year-old Edmund Pook, alleged father of the dead girl's unborn child, were discovered, the matter seemed open and shut. Yet there followed a remarkable legal odyssey full of unexpected twists as the police struggled to build a case. Meet Liz Lyon: respected TV producer, stressed-out executive, guilty single mother...woman of the hour. StoryWorld is the nation's favourite morning show, and producer Liz Lyon wants to keep it that way. Her job is to turn real-life stories into thrilling TV - and keep a lid on the scandals and backbiting that happen off-stage. But then simmering tensions erupt at the station, trapping Liz in a game of one-upmanship where she doesn't know the rules. As the power struggle intensifies, can Liz keep her cool and keep her job? Does she even want to? Woman of the Hour is by Jane Lythell. Any Minute Now is by Eric Van Lustbader. Red Rover, the blakest of black ops teams, is finished - betrayed on a mission to capture and interrogate a mysterious Saudi deep in Pakistan. One of the team was killed, the remaining two barely escaped alive. Now, the unit has been shut down and Greg Whitman and Felix Orteno are left adrift, wondering what went wrong. Into their midst comes Charlize Daou, a brilliant, wildly talented arms expert, who becomes the reason - and supplies the means - to resurrect their mission. Disobeying orders, they secretly set out to find the Saudi - the first step in a perilous journey that will lead them to the dark heart of a terrifying conspiracy that threatens to change the balance of power across the globe. Hallowe'en, and the people of Cork are partying. At half past two in the morning, a girl with green hair and sad eyes stumbles out of a club. She never makes it home. DS Katie Maguire and her team are stretched to their limit. A gang of dognappers are terrorising the kennel owners of Cork. The city's drug trade is at an all-time high. Now they have a missing girl to find too - and all in the glare of the media spotlight. As Katie closes in on the truth, she realises that the three cases might be connected. And that with every second she spends investigating, the clock ticks on for the missing girl, trapped in a living death... 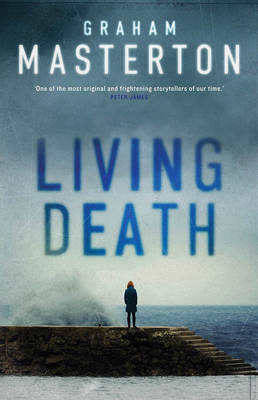 Living Death is by Graham Masterton. 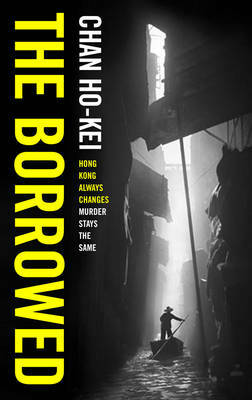 The Borrowed is by Chan Ho-Kei. Six interlocking stories. One spellbinding novel. The year is 2013, and Hong Kong's greatest detective is dying. For fifty years, Inspector Kwan quietly solved cases while the world changed around him. Now his partner Detective Lok has come to his deathbed for help with one final case. Where there is murder, there is humanity. This bold and intricate crime novel spans five decades of love, honour, race, class, jealousy and revenge in one of the most intriguing nations in the world. This is the story of a man who let justice shine in the space between black and white. This is the story of Hong Kong. A controversial, right-wing, German politician is due to speak at the Oxford Union. Following a series of murders linked to a violent anarchist group, the city is on high alert. DCI Hanlon has been partnered with DI Huss to ensure the speech goes smoothly and put an end to the killing. The murders soon reveal a chilling alliance between the anarchists and European Jihadis. And when Hanlon traces the killer she soon realises that the truth has a terrible price. Is Hanlon willing to meet the cost? An Incidental Death is by Alex Howard. 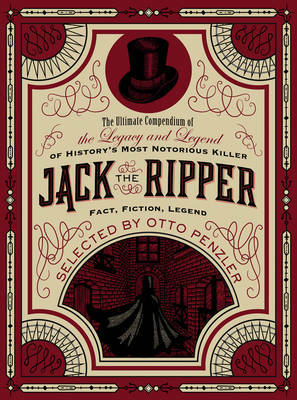 Jack the Ripper is edited by Otto Penzler. The predatory ritual, the escalating savagery of the crimes, the grisly trophies taken from his victim's bodies, the games played with his pursuers, the cannibalism: Jack the Ripper's reign of terror in London's East End during the autumn of 1888 casts a long shadow. Many have murdered more, but few have killed so brutally and none have forged such an enduring legend. For a century and a quarter the Ripper's crimes have appalled and fascinated in equal measure, inspiring over one hundred theories about this prototypical serial killer's identity and spawning thousands of works of fiction. This collection is the ultimate exploration of the Ripper legend. It sifts through Jack's legacy, blending the true story (told via contemporary reports and a century's worth of the best analysis) with the best crime and horror fiction his depraved deeds have inspired. UN covert negotiator, Yael Azoulay, has been sent to Reykjavik to broker a secret meeting between US President Freshwater and the Iranian president. Both parties want the violence to stop, but Yael soon realises that powerful enemies are pulling the strings. Enemies for whom peace means an end to their lucrative profit streams. The Reykjavik Assignment is by AdamLebor. Germany, October 1944: Dozens of cities lie in ruins. Enemy armies are at the gates. For the Thousand Year Reich, time is running out. Desperate to avoid the humiliation of unconditional surrender, German intelligence launch Operation Finisterre - a last-ditch plan to enable Hitler to deny the savage logic of a war on two fronts and bluff his way to the negotiating table. Success depends on two individuals: Stefan Portisch, a German naval officer washed ashore on the coast of Spain after the loss of his U-boat, and Hector Gomez, an ex-FBI detective, planted by Director J. Edgar Hoover in the middle of the most secret place on earth: the American atomic bomb complex. Both men will find themselves fighting for survival as Operation Finisterre plays itself out. 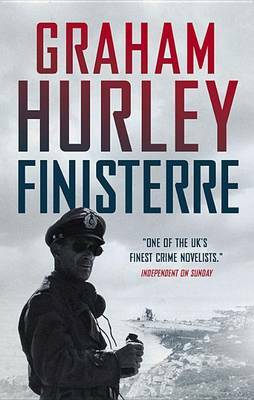 Finisterre is by Graham Hurley. 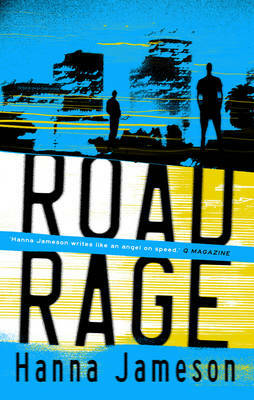 Road Rage is by Hanna Jameson. 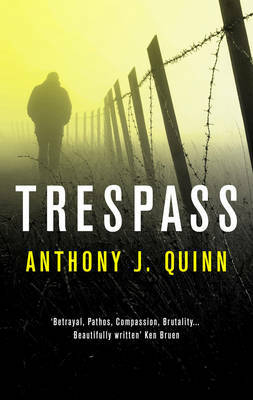 A new thriller set in the nowhereland between New York and LA. Eli and Ronnie are two British ex-cons on the road in America. Their mission is to find Trent, a guy who screwed them over and disappeared. But now, after forty hours driving through yellow desert, eating at lonely motels, what seemed real is no longer certain. Where did Trent stay? What did he do? Did he even exist at all? Leaving violent killings in their wake, Ronnie and Eli can do nothing except keep travelling. Now, trapped in a nightmarish road trip together, these two men must confront their own personal demons before they can come home.